University of Maine head coach Steve Trimper (left) chats with pitcher Tommy Lawrence prior to Friday afternoon's America East tournament game at Lowell, Mass. UMaine pitcher Steve Trask plays a game with his teammates as they try to stay loose in preparation for Friday afternoon's America East tournament game against Stony Brook. 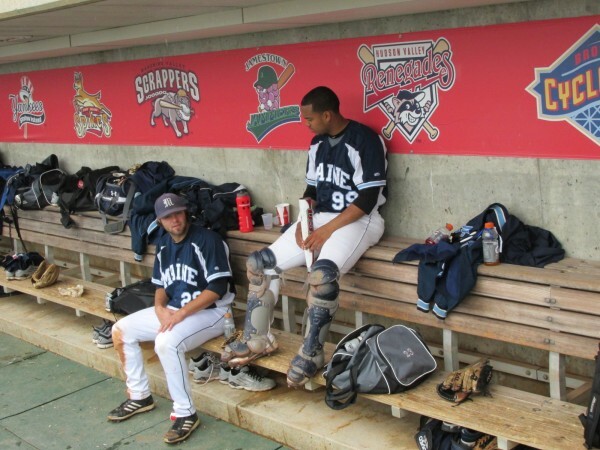 Scott Heath (left) and Jonathan Salcedo of the University of Maine share some down time in the University of Maine dugout prior to Friday's America East elimination game against Stony Brook at Lowell, Mass. 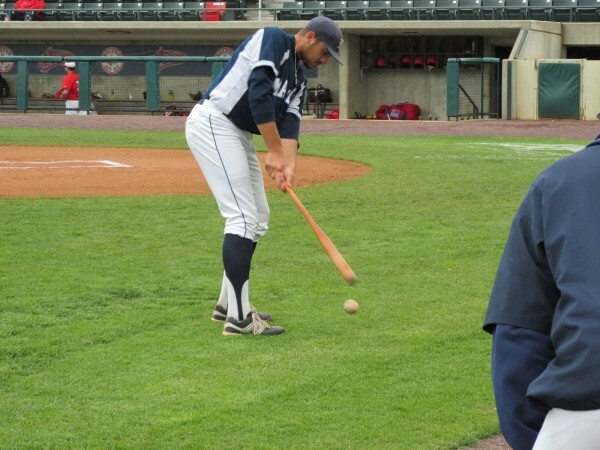 Luke Morrill of the University of Maine simulates a golf swing with a baseball bat as the Black Bears waited to play Friday's America East tournament game against Stony Brook. LOWELL, Mass. 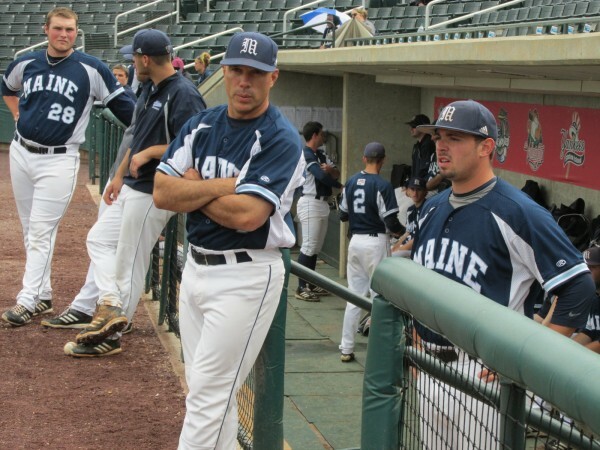 — Tommy Lawrence wasn’t about to wait around and take a chance that the University of Maine didn’t advance to the championship game of the America East baseball tournament. Thus, he demanded the ball Friday, barely 48 hours after throwing 104 pitches while hurling a two-hit shutout against Stony Brook on Wednesday evening. The junior right-hander gave the Black Bears 5 1/3 innings of one-run ball Friday night, helping UMaine post a 6-1 victory over Binghamton at LeLacheur Park. Coach Steve Trimper’s top-seeded ballclub (37-21) forced a decisive championship game against No. Binghamton (29-33) on Saturday at 3 p.m. The winner earns the league’s automatic bid to the NCAA tournament. UMaine had reached the championship round by virtue of a 3-1 victory over Stony Brook in Friday’s elimination game. The Bears arrived at the ballpark for the 2 p.m. resumption of a winners’ bracket contest against Binghamton that had been suspended Thursday night in the seventh inning because of rain. The Bearcats took a 10-2 victory to gain a spot in the championship round. Later, Lawrence (11-3) established a school single-season record for pitching wins, giving up eight hits but only one run while striking out five and walking four. He threw 119 pitches before being lifted in the fifth. 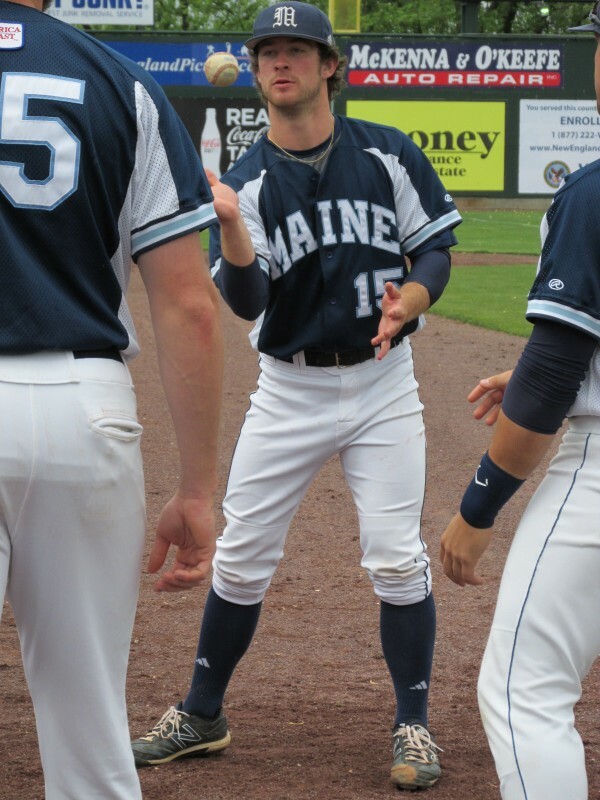 “You just know that a guy that wants to go with you and fight like that, and want to be in there, just makes you want to do the same thing,” said UMaine junior Troy Black, who stroked a triple and two singles with an RBI. “He’s a big piece of the puzzle. We wouldn’t be here without him, that’s for sure,” he added. Spurred on by their bulldog starter, the Bears scored five times in the first three innings against Bearcats righty Jay Lynch (6-5). Lynch made it stand up with superb relief help from junior co-captain D.J. Voisine, who retired each of the 10 batters he faced. That included inducing an inning-ending 1-6-3 double play with runners at first and third in the fifth. The heroics were shared Friday by versatile junior Mike Connolly. He caught the remaining 2 1/3 innings of the suspended game, then pitched an eight-hitter with three strikeouts and three walks against Stony Brook to help UMaine stay alive. Connolly (6-3), then put the catcher’s gear back on and played behind the plate for the entire nine innings of the nightcap. “That’s one of the most amazing things I’ve ever seen in college baseball,” Trimper said. “It just shows the grit and determination of this team … they just never give up,” he added. Eric White of Brewer and Brian Doran each doubled and singled and drove in a run for the Bears. Alex Calbick singled twice among 11 hits. David Schanz and Jake Thomas each had two singles for Binghamton. In the finale, UMaine scored all the runs it would need in the first inning. Sam Balzano of Portland and Black beat out infield infield singles, then Mike Fransoso’s sacrifice bunt led to a throwing error by the pitcher that plated a run. Black was tagged out between first and second, but Fransoso took second on the play. One out later, White lashed an opposite-field single past the dive of first baseman Brian Ruby to make it 2-0. UMaine tallied two runs in the second inning on a squeeze bunt by Colin Gay and Black’s triple to right and the Bears made it 5-0 in the third on White’s wind-blown double with one out and a two-out RBI pop-fly single to left field by Doran. In Friday’s 4 p.m. game, the Bears rode Connolly’s pitching into the championship round. “I think you’re always getting nervous when you’re in a ballgame where it could end your season,” said Fransoso, a senior co-captain who doubled, singled and knocked in two runs. Connolly worked around eight hits while throwing 121 pitches to outduel SBU’s Daniel Zamora. The freshman lefty (2-8) allowed only five hits and three runs over eight innings while striking out 13 and walking two. “I didn’t have the best stuff today, but I just tried to grind it out today,” said Connolly, who was determined to finish the game. The Seawolves broke the ice with a run in the fifth, but UMaine answered in the top of the sixth. Gay drew a leadoff walk, then Balzano chopped a double over the head of the first baseman. One out later, Fransoso grounded an 0-1 slider through the right side to give the Bears a 2-1 edge. “It just comes down to someone stepping up big in a big situation,” Fransoso said. “I knew I just needed to get the bat on the ball with [runners at] second and third, try to punch something through,” he added. Before the play ended on the eventual game-winning hit, Fransoso caught the SBU defense napping and swiped second base. “[Assistant coach Bill Cather] told me to take a look and both of them [shortstop, second baseman] had their backs turned and Zamora was walking back to the mound and I was like, no better time to do it. I just went for it,” said Fransoso, who had discussed such a play with Cather during the season. Fransoso then stole third and, with two out, White provided a key insurance run when he pulled a hard single to left field. White finished with three singles for UMaine, while Fransoso added a double to his day. Brett Tenuto singled twice and drove in SBU’s only run with an opposite-field hit to right with one out in the fifth. The Seawolves would have had more, but freshman catcher Jonathan Salcedo threw out Tenuto trying to steal and Connolly escaped after hitting a batter and allowing a single with two outs. Salcedo also threw out a would-be base-stealer after Johnny Caputo lined a leadoff double in the ninth. Earlier Friday, it took 14½ hours, but Binghamton took the upper hand in the tourney by finishing off the game that was halted by heavy rain in the seventh inning on Thursday night. On Thursday, Jack Rogalla held UMaine in check to put Binghamton in position to assert itself. He scattered six hits with five strikeouts and two walks in seven innings before torrential rain put an end to his outing and suspended the game. Reliever Greg Ostner gave up three hits but held the Black Bears scoreless when the game resumed on Friday. Rogalla (5-4) got off to a shaky start in the first inning when Black got aboard on an infield single with one out and Fransoso belted a two-run home run over the right-field fence. However, the Bears managed only four hits over the next 6⅓ innings and the Bearcats methodically erased the deficit and then pulled away. UMaine starter A.J. Bazdanes (6-6) did not have great command and lasted only four innings. He was touched up for seven hits and five runs (four earned). He struck out three and walked two. Binghamton tied the game with single runs in the second and third innings, then jumped in front with a three-run uprising after two men were out in the fourth. Nick Pancerella got things started with an infield single toward the middle of the diamond. Bazdanes walked Bill Bereszniewicz, then Zach Blanden hammered a two-run double to the gap in left-center field. The third run of the inning crossed the plate when Fransoso booted Schanz’s grounder to shortstop. The Bearcats put the game out of reach with three runs in the seventh, sparked by RBI hits by Bereszniewicz and Blanden, and two more in the eighth. Binghamton piled up 16 hits, including two doubles and three RBIs from Blanden. Jake Thomas and David Schanz each collected three singles, Bereszniewicz doubled and singled (2 RBIs), and Shaun McGraw hit two singles and drove in a run. Calbick led the UMaine offense with a double and two singles while Heath of Westbrook singled twice. White added a double.